I like a man who takes pride in their appearance. Maybe not more than me, but, you know, washes their face and does something with their hair. Some guys are below par, others are way above, either way Urban Cargo might just be the answer to your manscaping prayers. Go to the website and take a short survey on your grooming habits– preferences, hair type, skin type, etc. 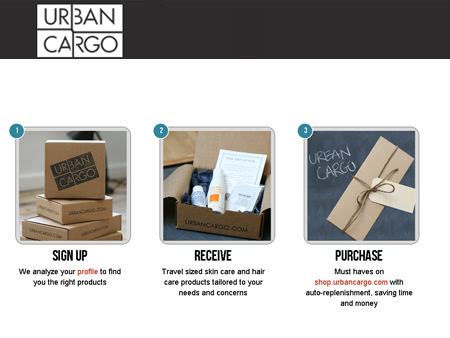 Based on your profile, Urban Cargo will send a cute little box with three or four nifty travel-sized products (shaving cream, face wash, lotion, etc) for your manscaping needs. Monthly subscriptions are only $14.95— a fraction of what the products actually cost. The idea is that men don’t actually have a place to test out and discover new grooming products. Urban Cargo wants to relieve this pain by offering the chance for their subscribers to do this in the comfort of their own home, so you can find what works for you before investing in the full-sized product. By consulting experts and other users, the company stays in-the-know and brings you rock star products that you’ll actually enjoy. The startup is backed by DreamIt Ventures, whose goal is to help great people build great companies. Urban Cargo sounds like just the company to fit that description. Especially if they are helping men step up their game. Win for them…win for the ladies. Oh yes, and check out Urban Cargo’s Pinterest page. I’m feeling a little faint now.